With the arrival of fall, it is time to start to embrace the season’s finest and put the memories of summer’s sweet stone fruit behind us. Fall brings us a myriad of apple varieties, some best for eating, while others are perfect for baked sweets. I am a Granny Smith girl myself when I want to snack on a crisp, juicy apple, and although they also are great for baking. Most apples are great for eating, but some are better when baked. Look for starchy, crisp apples that will hold their shape when baked. These include Honeycrisp, Braeburn, Fugi, Pink Lady, Red Delicious, or Mutsu. You can read more in our blog post Apple Harvest! Pears too are harvested every fall, and although we typically can find the common Bosc or Anjou pears in most grocery stores, other more unique varieties are now making their appearance as well and are equally delicious. In the photos, I used all Anjou pears as they had a great selection at my local market and I just couldn’t resist them, but you could also combine varieties if you like. Just choose pears that are very ripe but not mushy to use in this compote. 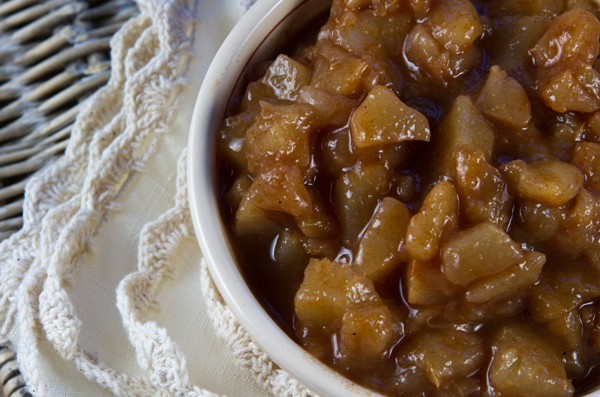 As soon as fall arrives, I begin to make my favorite apple and pear treats, including Roasted Applesauce, as well as this easy Roasted Pear or Apple Compote. 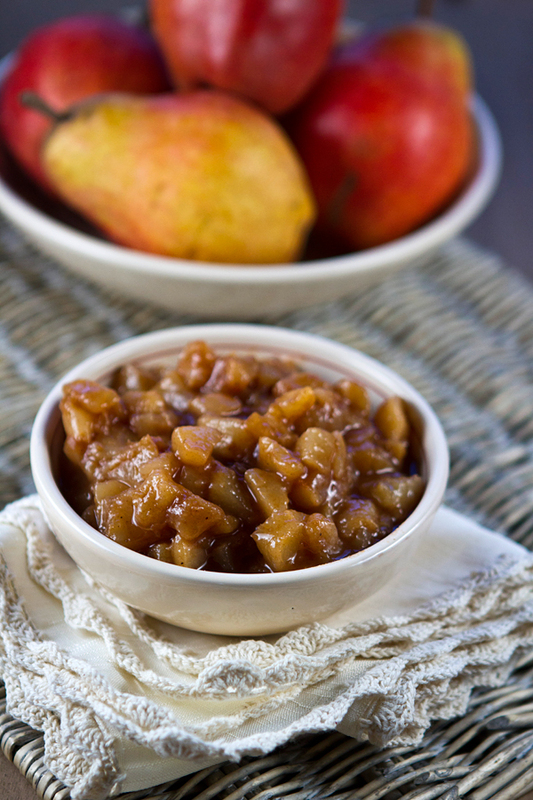 This compote is subtly sweet with a delicious cinnamon flavor and has so many uses. As well as scooping a big spoonful of compote on my morning hot cereal or bowl of Greek yogurt, I spoon it over frozen yogurt, on top of simple pound cakes, or enjoy it on its own. I have made this compote using just apples or just pears, and recently used a combination of both which was equally delicious. I do not like my fruit sauces or compotes too sweet, so I use just a couple of tablespoons of coconut palm sugar or brown sugar to sweeten, but you can adjust the sweetness for your own preference. For sweetening you can also use either honey, organic maple syrup, or agave syrup if you prefer. I usually try to use a combination of apple varieties when making an apple version of this recipe just because I feel it creates a more complex flavor, but any of the above listed apples or pears will work out great. You can keep this compote stored in the refrigerator in an airtight container for up to a week, but it also freezes well if you would prefer freezing half of it for enjoying later. The roasting time may vary depending on how crisp or fresh your fruit is. 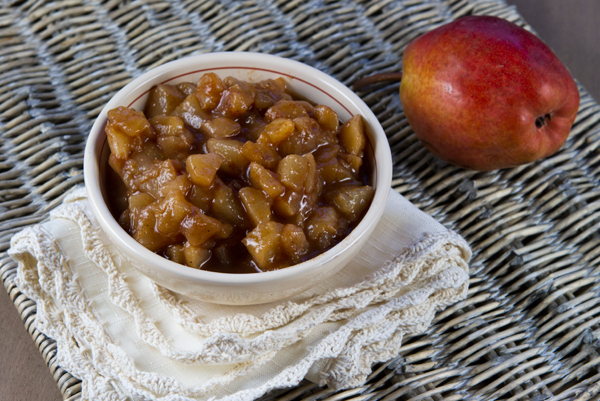 The compote should be soft, but the fruit should retain its shape and not become mushy. 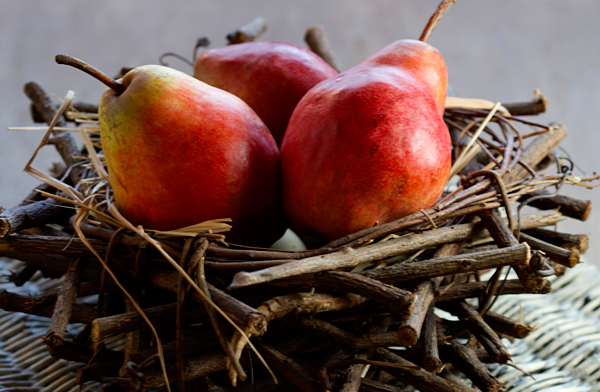 Apples and pears are known for their impressive list of phtyto-nutrients, anti-oxidants, and soluble fiber. Fruit based desserts such as this one add nutritional value to a meal and are not simply empty calories but are very satisfying and delicious. Minimal amount of sugar is used to allow the natural sweetness of the fruit to shine through. Peel, core, and dice the fruit into 3/4-inch pieces. Place the fruit, sweetener or choice, lemon juice and cinnamon in an oven-proof casserole with a lid and mix well. Bake covered for 25 minutes, then remove the lid and bake for another 2o minutes or until the fruit is tender. Cool to room temperature and use as desired.